I never thought that my photographs would end up in an exhibition. 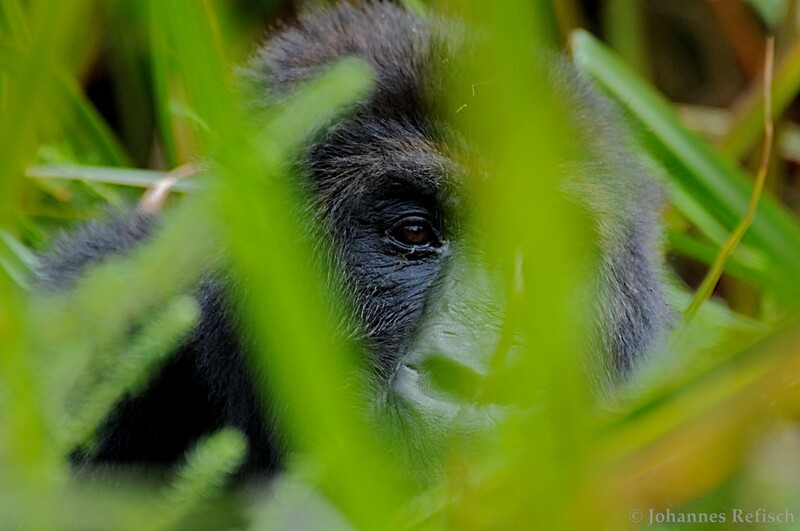 I enjoy taking photos, and started early on to document my work as primatologist and conservationist. 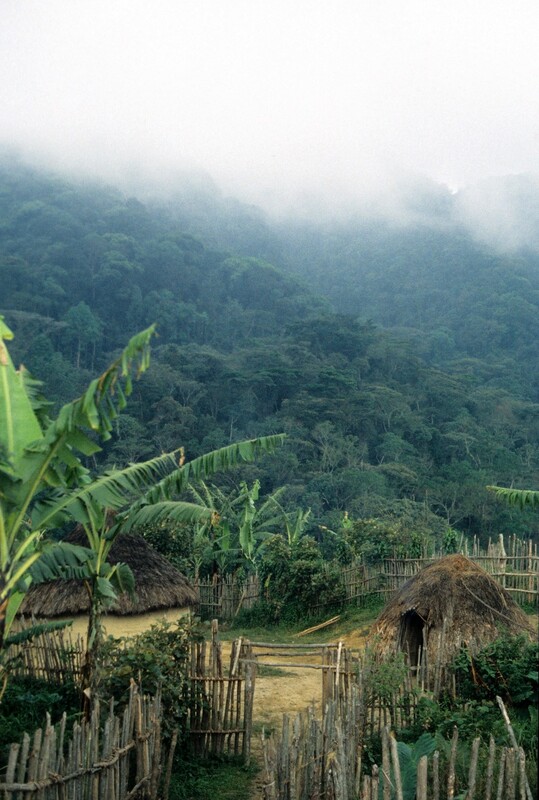 But I never imagined that my photos from the early 1990s in the former Zaire would gain historic value, simply because many of these fascinating rainforests have disappeared. 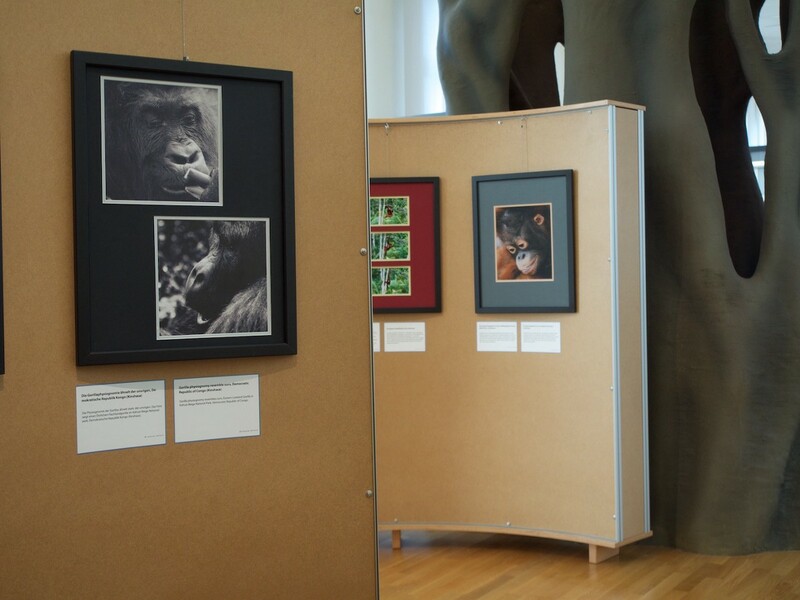 In 2012, the Alliance Francaise here in Nairobi approached the Great Apes Survival Partnership (GRASP) and asked whether we could develop an exhibition focusing on great apes, in order to raise awareness and better engage school classes. The result was “Their Fate is Ours: The Humanity of Great Apes,” a photo exhibition built around my work in Africa and Asia. The exhibition debuted in Nairobi in mid-2012, and has since been displayed in Mombasa, Bujumbura, Paris, Vienna and Dinslaken in Germany. The exhibition shows the incredible aesthetics of great apes and their habitats, it shows the humans who share their habitat with great apes, and it shows the many similarities between great apes and humans. The exhibition also emphasizes threats and challenges faced by great apes, and seeks to inspire commitment and action on their behalf. In 2014, the Alexander Koenig Research Museum in Germany was preparing to install an amazing exhibit that essentially reconstructed an entire rainforest from Gabon in the main hall. 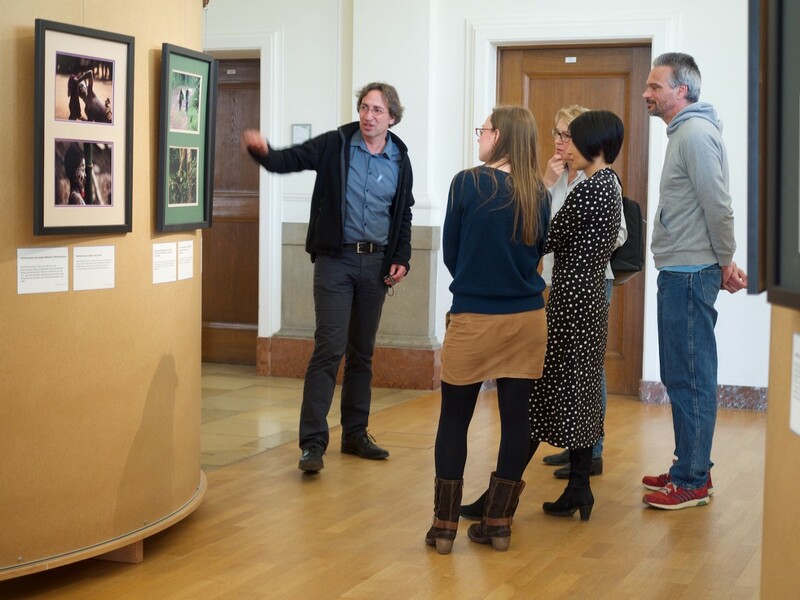 I met with the exhibition team at the museum, and they felt that the GRASP photo exhibition could complement the rainforest as a temporary special exhibition. The Koenig Museum (in German: Zoologisches Forschungsmuseum Alexander Koenig, abbreviated ZFMK) is an historic venue, a natural history museum and zoological research institution in Bonn. The museum is named after Alexander Koenig, who donated his collection of specimens to the institution. The museum was opened in 1934 and is affiliated with the University of Bonn. After the second world war, when most of Bonn was destroyed, the Parliamentary Council met at the Museum Koenig and drafted and adopted the constitution of West Germany, the Basic Law for the Federal Republic of Germany. And it was then that the first chancellor, Konrad Adenauer, was photographed sitting next to a stuffed giraffe. I wonder sometimes whether the world would be different if it had been a chimpanzee. The museum’s artificial rainforest itself was a mighty undertaking. The museum team used materials collected from the Ivingo National Park in Gabon, and more than 30,000 fake leaves were handcrafted to hang from the trees. 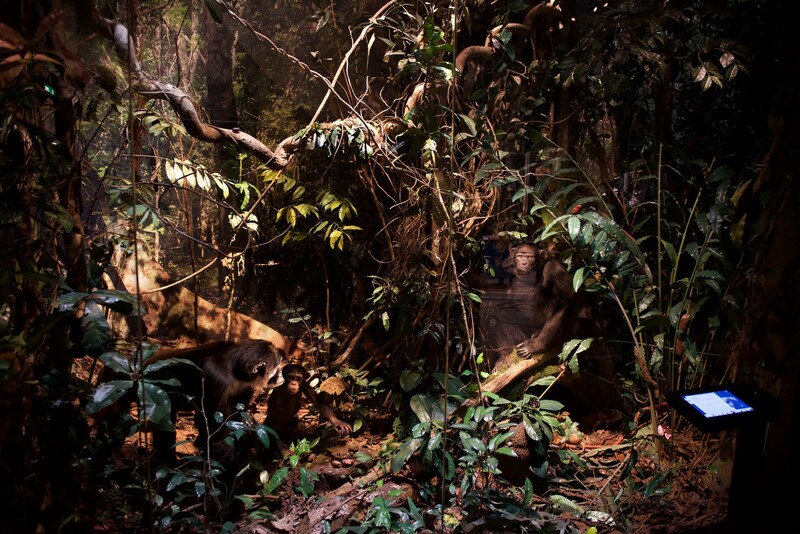 Visitors are taken on a virtual tour to the chimpanzees of the Taï National Park in Côte d’Ivoire, and and museum-goers can climb through an artificial fig tree to reach the second floor. In the long run this second floor will be converted into a forest canopy, but for the moment, it hosts the GRASP photo exhibition. 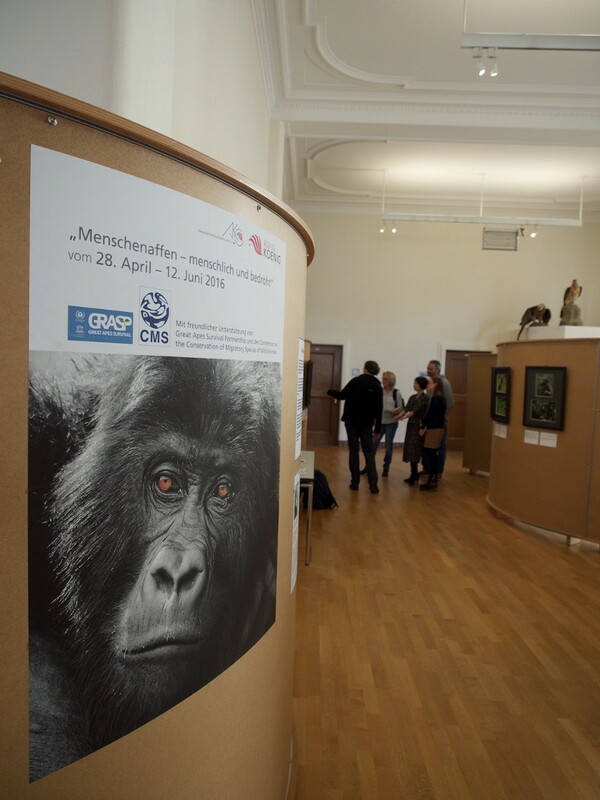 The official opening of the rainforest exhibition and the GRASP photos was on April 27. Nearly 300 invited guests from different German ministries, the United Nations, the research community and public life attended the ceremony. 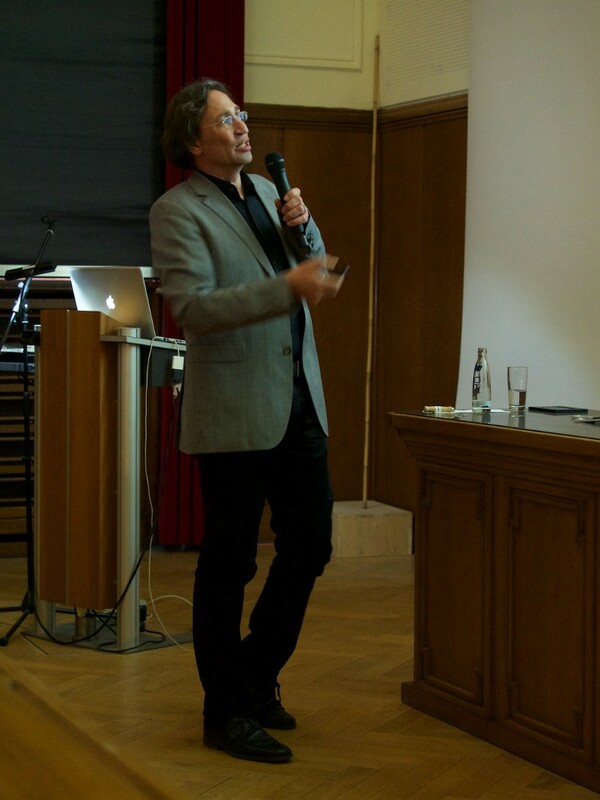 Two days later, I gave a public lecture at the museum, and the director, Prof. Wolfgang Waegele, and the Convention on Migratory Species (CMS) focal point to GRASP, Clara Nobbe, introduced me. 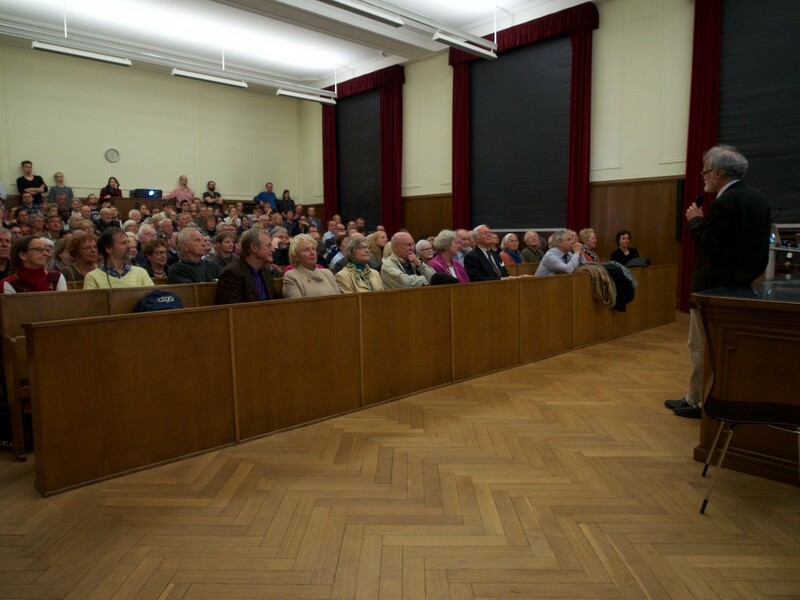 More than 200 people came to follow the lecture, which I found encouraging — I thought primatologists and their subjects, the great apes, were both slowly disappearing. I have had the privilege to observe chimpanzees, gorillas, bonobos and orangutans in their natural environment, sometimes in some of the most remote landscapes on this planet. Only a few people are this lucky, and never for me was there a boring day. I have always been fascinated by great apes, and I hope through this exhibition I am able to pass on not only this passion, but also the very real concerns related to the many challenges conserving great apes. My photographs already document lost landscapes; I would hate for them to document lost species too. “Their Fate is Ours: The Humanity of Great Apes” is available in booklets on Amazon in German and in English. 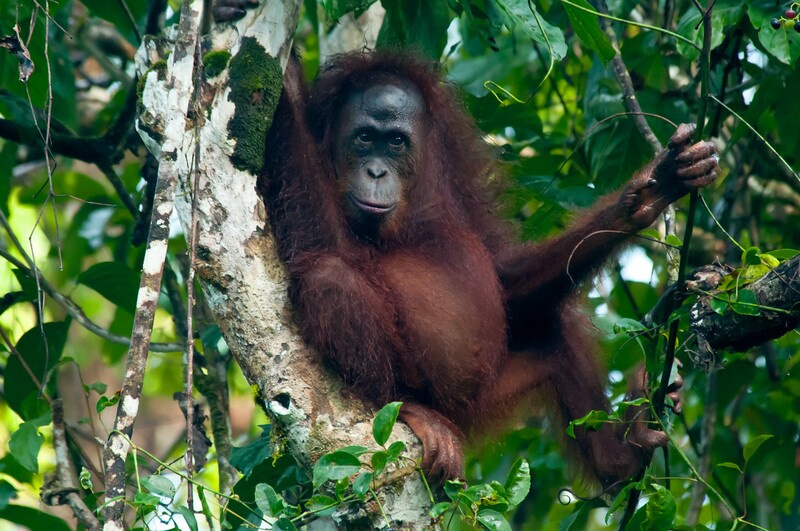 The Great Apes Survival Partnership is a UN initiative committed to ensuring the long-term survival of great apes and their habitats in Africa and Asia.